It was fun and challenging trying to get a good shot of the 1st lunar eclipse of 2014. If you missed it there will be another total eclipse in October viewable from North America. Normally when shooting the moon in the middle of the night it is difficult to expose for the moon and the surroundings unless they are very bright. 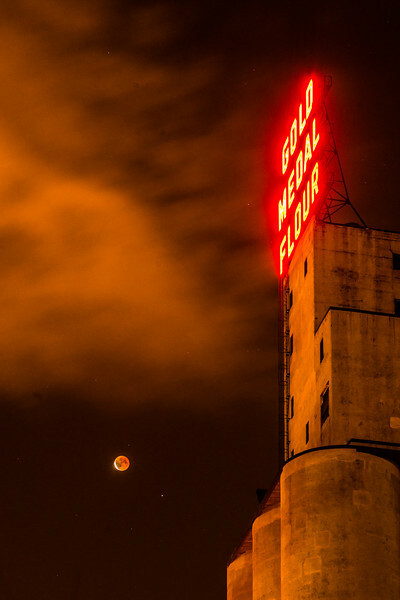 In the case of the eclipse, also know affectionately as the “blood moon” for it’s reddish appearance, the moon was very faint while the surroundings were bright at least in an urban environment. I was using a 70-400mm lens and I can tell you the moon moves very fast through the frame at that focal length. Normally I like to shoot the moon at 1/100th of a second or faster. In the case of the eclipse I found myself at close to 1 second to 4 seconds at the height of the eclipse. In fact if you didn’t know there was an eclipse you might not realize the moon was even out it was so dim. 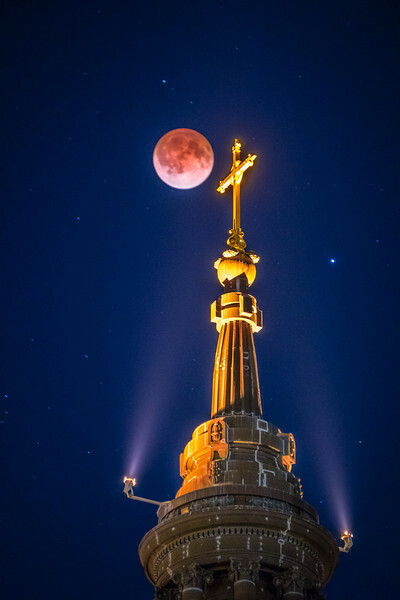 Blood moon over the cross on the Cathedral of Saint Paul. Later in the night I headed to Minneapolis to see what I could find. At a 90mm focal length vs. 400mm in the previous photo the moon isn’t moving quite so fast through the frame. I was surprised an 8 second exposure was as crisp as it was. Without the 8 seconds I wouldn’t have gotten the cloud movement with the neon sign. In either case I made a lot of adjustments in Lightroom and some in Photoshop. Mainly selective exposure and sharpening adjustments. The clarity slider in Lightroom 5 is a wonderful thing especially when combined with a radial filter. Only 6 months till the next blood moon! You can get more info about the April 2014 eclipse at Space.com.